The state of Florida has been occupied by humans for the last 12,000 years. To put that in perspective, the Great Pyramids in Egypt are only 4,000 years old. Here in Palm Beach County, direct evidence indicates human occupation dating back 6,000 years. These early people are referred to by archaeologists as the Archaic people. While some may think these early people were living along the coast, these early sites are actually found along the Hungryland Slough and on the Pahokee Ridge. Starting around 2,000 B.C. Native American populations began to grow and develop distinct cultural traits. It is often thought that a group called the Calusa lived in Palm Beach County. This theory is incorrect. The name of the people who lived here is unknown. The group died out or left the area by the time Europeans arrived in the region. When archaeologists do not know the name of a specific group of people they refer to the ancient inhabitants as a “culture”. In this case, the peoples who inhabited the area are thought to be part of the Belle Glade Culture. The Belle Glade people are thought to have lived throughout the Kissimmee River Valley, around Lake Okeechobee and the northern third of the former everglades. They made a plain pottery that was fired at very high temperatures. They also built large earthen monuments which changed forms over time. Starting around a 1,000 B.C. the Belle Glade people built large circular ditches. These circles could be as much as 1,500 feet in diameter. One such circle is the Whitebelt Circle located in the Dupuis Natural Area. Archaeologists are unsure what function these giant circles may have served, but there is an untested theory that they may have been built to “contain” massive ritual feasts. 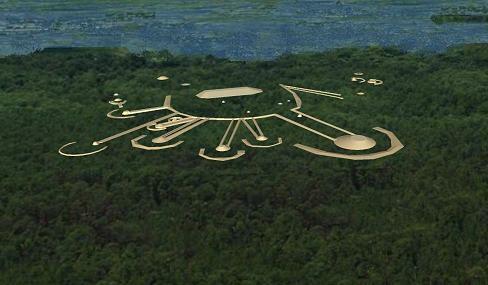 The next earthwork form the Belle Glade people are thought to have built are massive radiating earthworks. These earthworks are thought to date between 1,200 - 1,500 A.D. As such, they are the last earthworks to be built in South Florida. These mounds have a form that is completely unique. Nowhere else in the world are these combinations of causeways, circular earthen mounds and crescent shapes arranged in a similar fashion. There has been much speculation over the decades regarding the function of these earthworks. Dr. Sears of FAU speculated these forms were used to grow corn. However, this idea has since been proven incorrect. Two radiating earthworks are located within the Corbett Wildlife Management Area. The first is Big Gopher Mound and the second is Big Mound City. Little is known of the smaller of the two mounds, Big Gopher Mound. One small scale excavation was undertaken on the site in the 1990s. This investigation did not reveal much to further the understanding of these sites. It was recently learned however, that the mound complex was surveyed by James Marshall around 1983-1984. His research may help unlock the true scale and size of this ancient monument. Big Mound City is the largest prehistoric Native American earthwork in southeastern Florida. John Kunkel Small, Curator of the New York Botanic Garden, came to South Florida to collect and document plant specimens on many occasions. On one trip in 1928, Small photographed Big Mound City. His photographs are the earliest known documentation efforts of the monument. Archaeologically, the site was initially investigated in 1933-1934 by Mr. Gene Sterling under the Works Progress Administration (WPA). While large sections of the site were excavated, very few artifacts were recovered. This would indicate that very few people were living at the site or the site was only occupied for brief periods during the year. Since the 1930s, scientists have speculated as to what function this mound complex may have served. Recent research suggests the arms of the mound complex may be aligned to celestial events like solstices, equinoxes or other events like the rise and fall of Venus. 1)	In 1837, during the Second Seminole War after the Battle of Okeechobee, General Jessup chased a band of Seminoles southwest along the Loxahatchee Escarpment. It was recorded that a small skirmish took place. It is now thought this took place on or near Big Mound City. 2)	The property was commercially logged by the Southern States Timber Company for its slash pine and cypress. Even today large piles of sawdust can be found from the logging period. The Southern States Timber Company was a subsidiary company for Hamilton Disston. Hamilton Disston was responsible for the original efforts to drain the everglades in the late 1880s. 3)	Either an escaped slave or freed black community was once located someplace on the property (likely near the Big Mound City). It is reported the settlements existed between the 1880s and 1920s. To date no trace of the settlement has been found. 5)	During the 1950s and 1960s large, randomly scattered areas were planted with tomatoes. Today these areas look like they have never been touched by humans but, when one walks the area and looks closely, long low linear rows can be found in both shrubby pine and swamp areas. If you have an oral tradition you would like to contribute please contact Friends of Corbett. (Corbett information). We encourage you to enjoy the area responsibly.